Shot on a bare-bones budget of approximately $5,000, Following (1999) is the auspicious feature film debut of writer/director Christopher Nolan. Shot sporadically over a year on black and white 16 mm film stock, it would introduce many of the themes that continue to fascinate the filmmaker, chief among them that things aren’t always as they seem. It did the film festival circuit and had a brief (and tiny) theatrical run before disappearing, but the seeds had been planted for Nolan’s next film, Memento (2000), which would be his breakthrough into the mainstream. 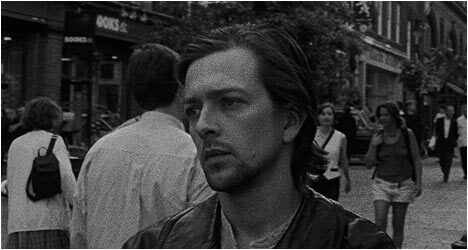 A lonely young man (Theobald) takes to the streets and follows people that intrigue him. He doesn’t do anything – just observe them and then goes home. He aspires to be a writer and sees this habit as a way of doing research for his writing. His life gets complicated when he stops following random people and takes an interest in a blonde woman (Russell). One day, he follows a well-dressed man named Cobb (Haw) who catches him following him. They get to talking and Cobb convinces the young man to help him steal CDs and then sell them. Alex Haw plays a very cerebral thief as evident in the scene where Cobb explains to the young man what you can tell about people from their possessions. He’s a savvy expert of human behavior and takes the man under his wing, teaching him what he knows. Cobb introduces the young man to a shadowy underworld where nothing is what it seems. Jeremy Theobald is quite good as the voyeuristic thief wannabe who soon becomes an active burglar, transforming himself with Cobb as his model. His extracurricular activities fuel his writing and he finds that he can’t stop one because it might affect the other. He’s also developed a real taste of burglary and it becomes an overriding obsession. In the liner notes, Following is cited at a possible cinematic blueprint for one of Nolan’s later films, Inception (2010). Both films feature well-dressed thieves named Cobb who are articulate and seem more interested in finding out what is in someone’s mind rather than what is in their home. More so than any of his other films, Following is about voyeurism. It is only when the young man becomes an active participant that he gets into trouble. Much like Memento, Following features a fragmented narrative that is perhaps a reflection of the protagonist’s gradually unraveling mind. It is a cinematic sleight of hand game that Nolan is fond of playing, having fully embraced it with The Prestige (2006). And like with those films, as they go on more is revealed, like peeling away layers of an onion and a bigger picture is uncovered. Despite its low-budget aesthetic, Following is a self-assured debut of someone who would go on to become a major filmmaker. He got his start in the independent film scene and quickly graduated to big budget studio films without compromising his thematic preoccupations. Following has never looked better on this new Criterion Collection Blu-Ray, which features a pristine transfer without losing any of the filmic quality of this low-budget indie. There is an audio commentary by writer/director Christopher Nolan. He wrote the screenplay assuming he would have no budget to work with. On this film, he wanted to explore non-linear storytelling in an attempt to replicate the way our minds re-order memories. Nolan devised a stylistic approach that would allow him to shoot on his own or with a very small crew. Nolan touches upon the film’s themes and filming anecdotes. There is an interview with Nolan that was done in 2010. He points out that he’s a self-taught filmmaking, making them when he was a kid. He talks about going from making short films on weekend to making Following the same way. Nolan talks about the benefits of working with black and white film stock. As you would expect, he comes across as an eloquent and intelligent person. You can watch the film in chronological order, which puts an interesting spin on the material. “Script to Film” compares three scenes from the film with their corresponding passages in the shooting script. One sees that there was very little deviation or improvising involved. Also included is the short film Doodlebug that he made in 1997 while attending University College London. Several people who worked on Following also contributed to this one. It features a man (Following’s Theobald) trying to squash a tiny version of himself with a shoe like one might smash a cockroach. Finally, there are theatrical and re-release trailers.